Wholesale homegrown buffalo meat -half and quarters. Buffalo robes, heads, hides, leather and buffalo leather goods . 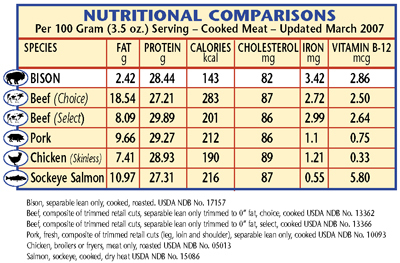 Buffalo Meat is Heart Healthy!!! Tri-tip Steak (2-3 lbs) $10.50/lb. Moccasins, fringed slipper, gold $45.00/pair. Leather available by the piece @$15.00/sq ft.
""My wife had not eaten meat for years, but after watching me enjoy burgers by the dozen, she gave in to try buffalo. With a wide-eyed excitement she said: "Don't buy another pound of beef. I want you to buy buffalo from this day on and nothing else! It's superb!" From Arne K. of Washington .